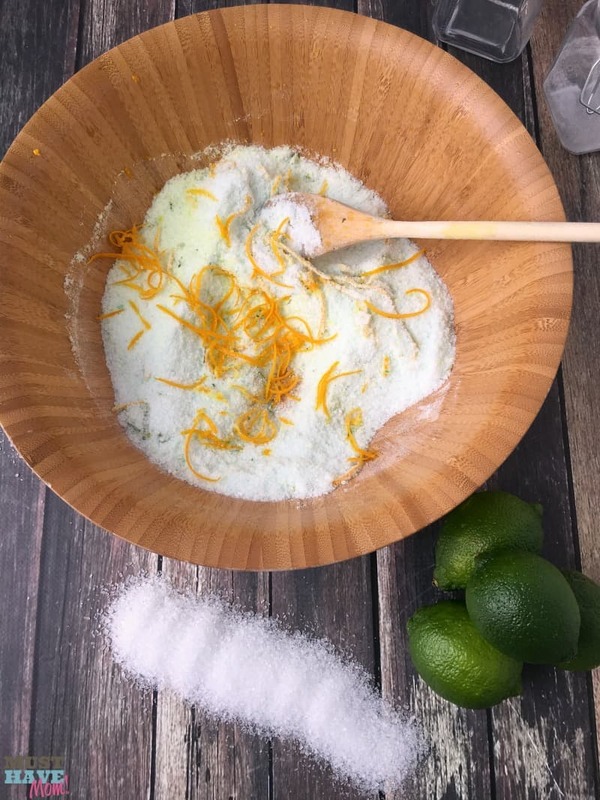 DIY Citrus Mint Epsom Salt Foot Soak For Tired Feet + Pedicure Basket Gift Idea! If you have tired feet that need refreshing then I’ve got just the thing for you! After a long day shopping or walking around your feet deserve to be pampered! 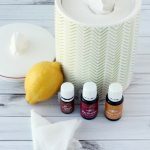 This DIY citrus mint epsom salt foot soak is exactly what your tired feet need to feel rejuvenated and re-energized. Not only that, but it also makes a fantastic DIY gift idea and goes perfectly into a DIY pedicure gift basket. Mother’s Day is coming up this Sunday so be sure to whip this together (it only takes 5-10 minutes!) 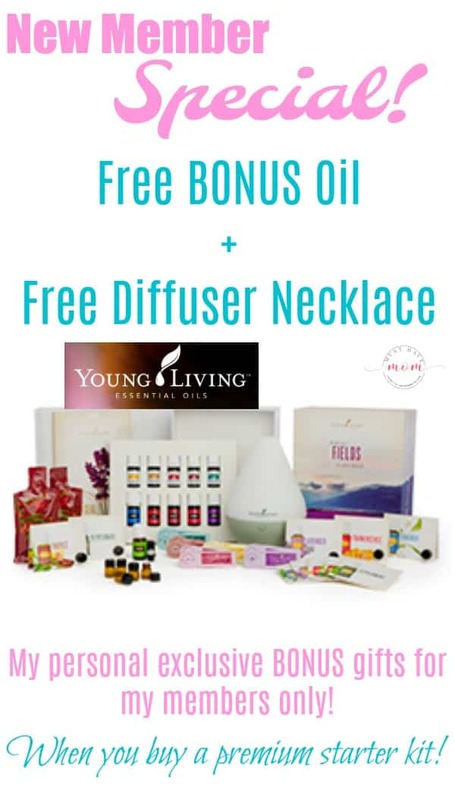 and you’ll have the perfect gift for mom! 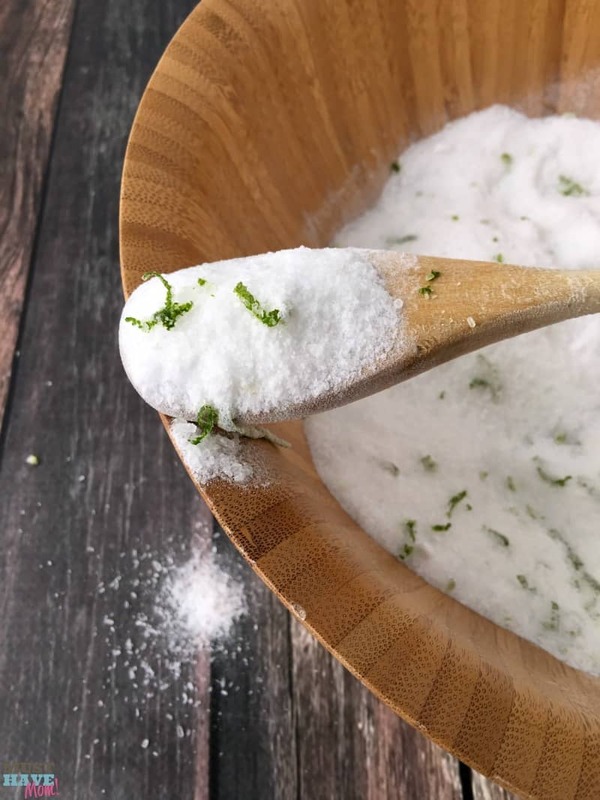 To make this citrus mint epsom salt foot soak recipe you’ll need epsom salts, baking soda, one lime, one orange, citrus essential oil and peppermint essential oil. You’ll also want a pretty jar to package it up in. 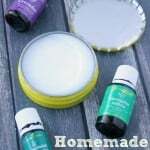 Begin by combining 2 cups of epsom salts, 1/2 cup baking soda, zest of one lime and one orange, 3-4 drops citrus fresh essential oil and 3-4 drops of peppermint essential oil in a bowl. Stir together with a spoon to mix well. I also added a drop of green food coloring to mine to give it a little bit of color. This is completely optional (and will NOT stain feet). 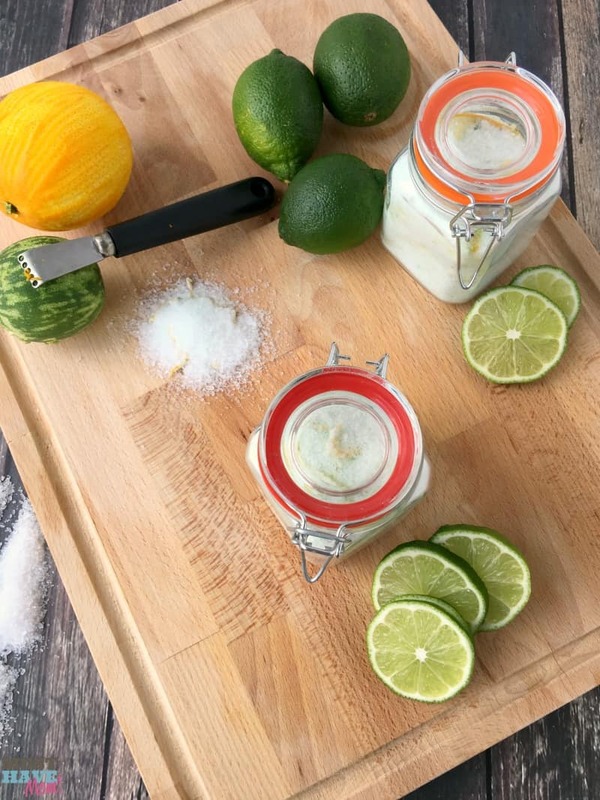 Then package your citrus mint epsom salt foot soak into pretty jars. I used spice jars. Mason jars would also work well. You’ll need to store it in the fridge to keep it fresh. 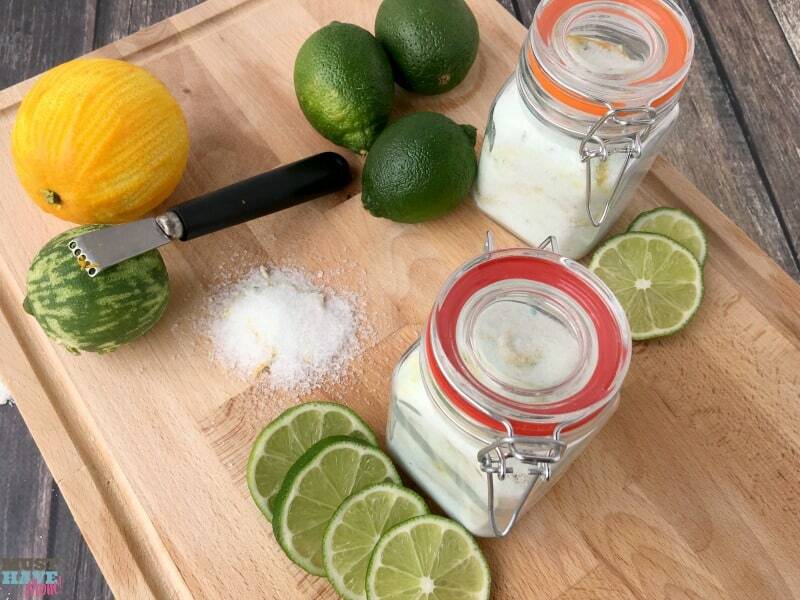 If you’d like it to last longer and keep at room temperature then simply omit the citrus zest. To use simply add it to a basin of warm-hot water and soak your feet. Now it’s time to put together an amazing DIY pedicure basket that is the perfect gift idea for Mother’s Day, teacher appreciation, Birthday, etc! I would love to be on the receiving end of this! I found a really cool retro milk crate at Target that I thought would be perfect for this! You could also find a neat metal basin to serve as the water basin for the foot soak! I then stacked two towels in it so you have one for under the basin and one to dry your feet. I included my citrus mint epsom salt foot soak packaged in pretty spice jars. You MUST include an Amopé™ Pedi perfect™ wet and dry rechargeable foot file. This tool is amazing and leaves feet feeling even better than a professional pedicure! I LOVE mine. You can use it wet (in the shower, after/during your foot soak) or dry. It is rechargeable (yay no batteries!) and has two speeds so you can do it at your comfort level. The Amopé™ Pedi perfect™ will quickly get rid of even the ickiest cracks on your feet and reveal new beautiful skin underneath. It even works on my husband’s dry, cracked feet. I’m really amazed by it. Basically it’s the WOW gift in the pedicure gift basket because they’ll get to feel like they actually visited a spa for an expensive pedicure. You can buy it here and be sure to save up to $17.50 on Amopé products by printing off the available coupons! 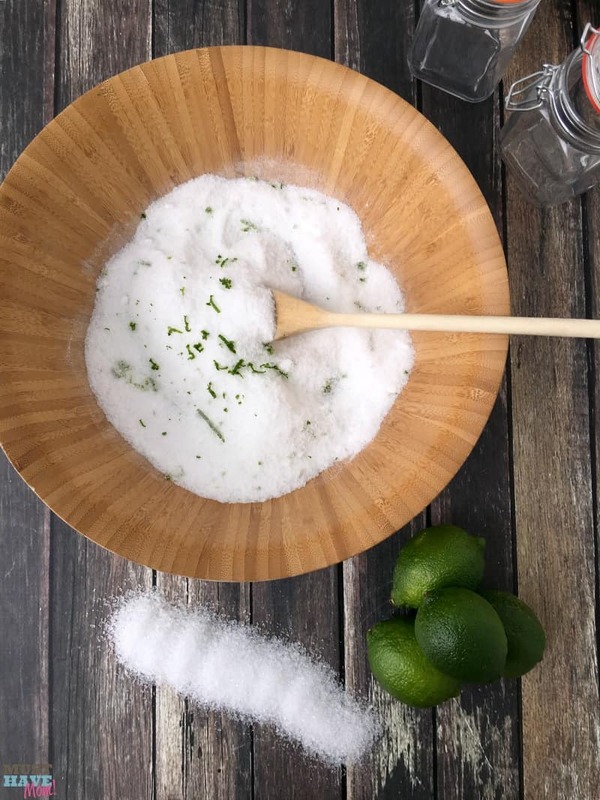 You can print off the citrus mint epsom salt foot soak recipe below! If you enjoyed this post please pin it or share on Facebook for easy finding later! 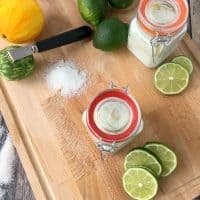 Easy DIY citrus mint epsom salt foot soak that will rejuvenate tired feet and help restore dry, cracked feet. Combine all ingredients in a medium bowl and mix together thoroughly. Pour the mixture into a pretty spice jar, mason jar or plastic bag. 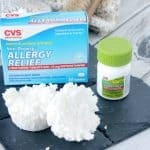 Store in the fridge and use within 2 weeks. 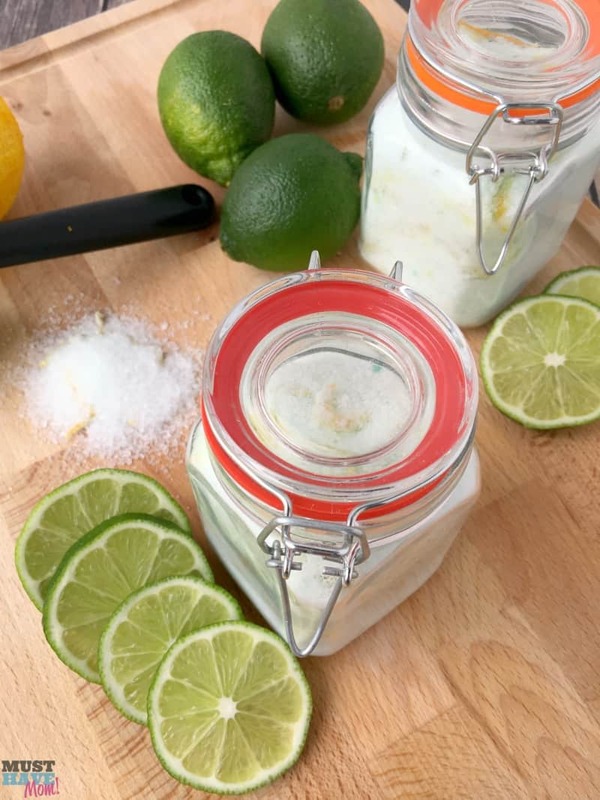 *Optional: for longer storage omit citrus and lime zest and store at room temperature. 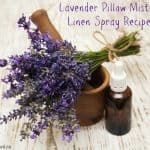 Oh my goodness – I can smell this now, just after reading your post! I bet it feels amazing. What a great gift idea for anyone, really! This must smell wonderful. I will have to whip up a batch and try this for myself, thanks for this. Those limes are jumping out at me, I can only imagine how refreshing this on tired feet after a long day! Amazing, I love do-it-yourself ideas like this. It would be nice to get a bunch of my girlfriends together for a Spa Making Party. Oh, that would be a fun idea for a girls night. I absolutely LOVE this idea! Anything homemade as a gift is the way to go in my opinion. I have a friend who is very pregnant and about to give birth in less than a month so I’m looking to do something nice for her; I think this is definitely at the top of the list! This looks so easy. I’ll need to try this soon! We use Epsom salts all the time. They are so healing. I’ll have to try adding citrus next time. It adds such a great and refreshing smell.